What is Ayurveda and its approach to health? Ayurveda is rooted in antiquity and it is known by many to be one of the oldest medical systems still thriving today. Originating over 5000 years ago from India’s wise sages and seers, it has been transmitted throughout the generations and remains as a living wisdom practiced by yogis, masters, doctors, and healers throughout India and abroad. Ayurveda means “the science of life”, which allows a lens to see and understand the interconnectedness of nature and its movements. 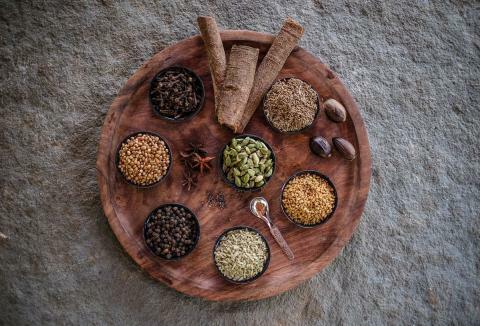 From the intricacies of creation to the practicality of daily life, Ayurveda speaks to all facets, aiming at preventative measures and maintenance of health in mind, body and spirit. Ultimately, with consciousness and awareness, health and balance can be achieved as disease is lessened and longevity is the result. When one abides by Ayurvedic principles, a higher quality of life is the sweet return. In Ayurvedic Medicine, each person is a dynamic being made up of his or her own unique individual constitution and elemental structure that began at the time of conception. How one interacts with nature and how the body and mind responds throughout the life will reveal what brings a particular person a state of balance or a state of disease. Our bodies are constantly changing, as is our environment, the seasons, our emotional state, etc. Ayurveda assists us to find our unique holistic pathway uncovering the truth of our nature. The choices we make are our own and the interaction we pursue will either result in balance or disharmony to our overall health and longevity. Ayurvedic Medicine approaches each individual according to his or her own needs. With an Ayurvedic Consultation, your individual constitution is determined by characteristics of body type, past medical history, habits and nuances throughout the life, etc. To identify these unique tenancies creates a possibility of change. Ayurveda is a classical system of medicine and has a treatment approach for all ailments. By forming a plan around diet and lifestyle changes, it provides a thorough and holistic direction, giving the individual tools to take up his or her own healing in very real and practical ways. It meets one exactly where he or she is, empowering change in one’s life with renewed transformation. Ayurvedic massage is a unique and special type of massage. The primary focus of this massage is the absorption of medicinal oil into the deeper tissues while it pacifies the excess wind in the body. This massage is applied with continuous strokes and techniques creating a dynamic and rejuvenating experience. It is deeply nourishing while simultaneously assists the removal of toxins within the gross and subtle bodies. It is highly recommended for jet-lag, exhaustion, insomnia, stiffness, fatigue, circulation disorders, and other wind-related issues. 4 Handed Abhyanga – (60 min) The Ayurvedic massage can be given by two skilled practitioners simultaneously using four hands in a synchronized flow and rhythm. It is such a unique experience to receive this kind of treatment, especially while you are in India! Highly recommended. Abhyanga massage accompanied with an herbal steam rejuvenates the body, mind and spirit. The combination of warm medicinal oil massaged deeply into the bodily tissues followed by herbal steam therapy makes the body, supple, radiant, and flexible. When we are fatigued by stress, tension, hard work, late nights and exhaustive schedules, our tissues become depleted, dry, weak and constricted; causing pain, inflammation and tired muscles. This therapy helps one to recalibrate, refresh and reawaken one’s own innate remembrance of bliss. Metaphorically, this treatment is akin to softening an old piece of driftwood to become bendable and moveable. Shirodhara – (60 min) This incredible therapy is often termed as a “pituitary or pineal gland massage”. It is a unique stress relief treatment allowing the mind and body to deeply relax as the nervous system unwinds. “Shiro” means head and “dhara” means to pour in sanskrit. This therapy involves a warm stream of oil, milk or other medicine substances in a liquid base to be poured gently and consistently on the “third-eye” point above the eyebrows. It invokes a dream like state, where the master gland is penetrated and nourished so the overall healing mechanisms of the body feel calibrated. It includes a head, neck, and face massage. Therapeutically it stimulates hair growth, prevents graying, relieves insomnia, eliminates afflictions of the head neck and senses, opens awareness and brings mental clarity. Best results if done in a consecutive sequence. Additional Ayurvedic therapies are offered at Samata, which may be suited according to your body’s constitution and therapeutic needs. Enquire with the staff at the Samata Clinic to book an Ayurvedic Basic Consultation. Nadi Sveda – Fomentation therapy for localized area or all over body. “Nadi” is a tube. Steam is generated and directed through a tube to specific areas of the body. Steam therapy is accompanied with medicinal oil, meant to open the channels allowing for a release of toxins and greater absorption of the medicinal oils to the deeper tissues. Great for inducing flexibility where there is stiffness in the back, sides, waist, joints, muscles, etc. Useful in heaviness of body, paralysis, spondylosis, sciatica, and pain. Kati Basti – Localized oil bath for the lower back. This treatment provides stability to the area which has been afflicted by improper movement, pain, spasms, nerve damage, etc. A dam like structure is made from dough and warm medicated oil is poured in and kept for a period of time bringing relief to the base of the spine and surrounding area. This ultimately allows the whole body to unwind and enter into deep layers of relaxation. Netra Basti – (60 min) Golden bath for the eyes. This unique therapy is incredibly beneficial for the eyes and ailments of the head. Similar to the Kati Basti, a dam made of dough creates a stable structure to hold a warm pool of ghee for the eyes to bath in. This treatment is calming, soothing to tired, dry, itchy and sore eyes. It relieves stress and nervous tensions within the socket, and improves vision and pacifies “computer eyes”. A divine bath that brings beautification and nourishes and rejuvenates the windows to your soul. Nasya – (60 min) An effective treatment to enhance the function of all sense organs. It alleviates diseases or ailments that are associated with nose, ears, eyes, throat and head, and helps to prevent early graying or loss of hair. Nasya is one of the 5 cleansing treatments of Ayurveda as it allows for the elimination of congested toxins in the head and nose. It is a wonderful therapy that brings clarity to the mind, and enlivens all sense organs. The nose is the gateway to which prana or breath enters the body and mind. By administering medicinal oil into this passageway it can relieve headache, tightness in jaw, stiffness of neck, elimination of mucous, improvement of memory, and a whole host of other ailments. Nasya therapy includes a face massage followed by fomentation to help soften and loosen any toxins that can be alleviated by the process. Best results if done in a consecutive sequence. Shiro Abhyanga – Enjoy a medicinal face massage and aromatic herbal steam. A beautiful treatment that utilizes aromatic oils to open the channels, allowing lymph to flow, head and face points to be activated, providing an overall feeling of deep awakening.